A custom-made electric guitar played by Beatles John Lennon and George Harrison sold for $408,000 at auction over the weekend. The customized VOX guitar – which sold for double the expected amount – was part of the annual Music Icons auctions held on May 18th at the Hard Rock Café in Times Square, Billboard reports. "The rare offering of a VOX guitar played by both John Lennon and George Harrison is what rock & roll legends are made of," noted the auction house, Julien's Auctions. 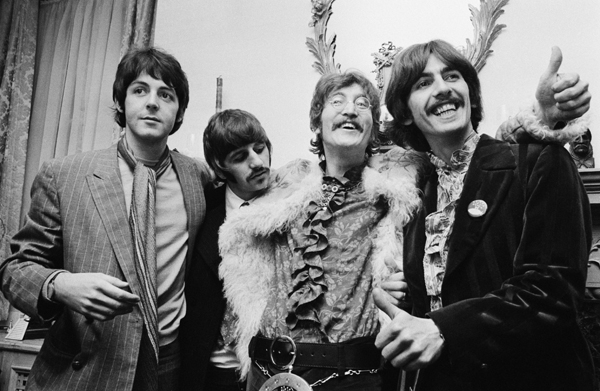 Harrison had practiced "I Am the Walrus" on the instrument, while Lennon featured it in a video session for "Hello Goodbye," both of which were on the Beatles' 1967 album Magical Mystery Tour. The guitar, custom made guitar by Mike Bennett and Dickey Denney, was presented as a gift to "Magic Alex" Mardas, an engineer at Apple Records and close friend of the Beatles, in 1967. The instrument had been displayed at a museum in Ireland in recent weeks after being sold a few years ago by Christie's Auction House for more than $100,000. Other items on the block included memorabilia from David Bowie, Jimi Hendrix and Michael Jackson.